The Common Palmfly is quite widespread in Singapore, and is observed in urban parks and gardens, particularly where its caterpillar host plants (various palms) are cultivated. A favourite host plant is the Yellow Cane Palm (Dypsis lutescens) which is often used as an ornamental palm in home gardens. 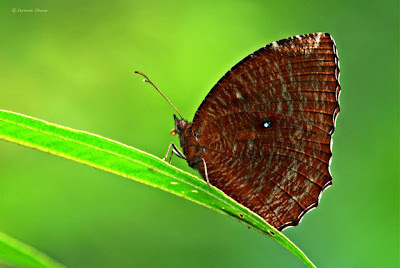 The butterfly has a slow flight, although it is very skittish and not easily approached. The upperside of the Common Palmfly features dark bluish black forewings with light blue submarginal spots and reddish purple hindwings. The underside is reddish brown with light grey striations. There is usually a white spot at the costa of the hindwing, although in some individuals, this spot can be missing. This shot of the Common Palmfly was taken by young ButterflyCircle member Jerome Chua.